In conventional reinforced concrete, the high tensile strength of steel is combined with concrete's great compressive strength to form a structural material that is strong in both compression and tension. The principle behind pre-stressed concrete is that compressive stresses induced by high-strength steel tendons in a concrete member before loads are applied will balance the tensile stresses imposed in the member during service. So we can say that Pre-stressed concrete is an architectural and structural material possessing great strength. This strength accomplished by combining the best properties of tow quality materials: high strength concrete for compressing and high tensile steel strand for tension. Actually, pre-stressing is quite simple. High tensile strands are stretched between abutments at each end of long casting beds. Concrete is then poured into casting machine encasing the strands. As the concrete sets, it bonds to the tensioned steel. When the concrete reaches as a specific strength, the strands are released from abutments this compresses the concrete, arches the member, and creates a built in resistance to service leads. Pre-stressed beams can span longer distance at similar depths than ordinary reinforced beams. 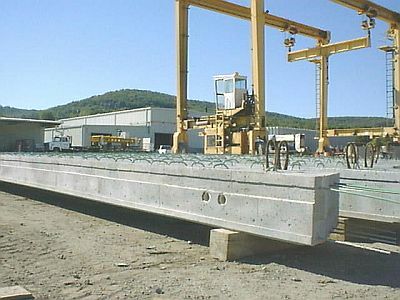 They can also reduce the amount of steel required in a beam, and therefore can be produced at a lower cost. These beams can have similar cross sections to standard bridge beams, or can have a new cross section, as requested by the client. • Future extension of deck easily implemented by addition of pre-stressed beams.